Why does President Obama's mug have a lid on it during his appearance on The Daily Show from last night? As you can see in this screencap, the president's mug has a lid over it. Is this a security measure? Why not just not have a mug on the desk? What's going on here? It's a style of coffee/tea mug that keeps the beverage warm. The lid has a small hole in it that you can drink through. I imagine it might also be to help avoid an accidental, embarrassing spill during a casual sip of his mug during a live TV interview. I can't remember where I read this, but I remember reading an article a while back about Bill Clinton, who on a presidential pub crawl in Ireland had his pint glass (glasses?) taken away by staff who were concerned that his DNA could be extracted from saliva on the lip of the glass, and that, while this sounded weird, it was actually a standard security precaution, probably because DNA is easy to amplify and place at locations where it would not normally be found. I'm not suggesting any global conspiracy theories to clone Bill Clinton or frame him for crimes he did not commit, and as I say I can't find this original article, but that's what I thought I read, and I could see why that would be an issue for high profile people, including Obama. 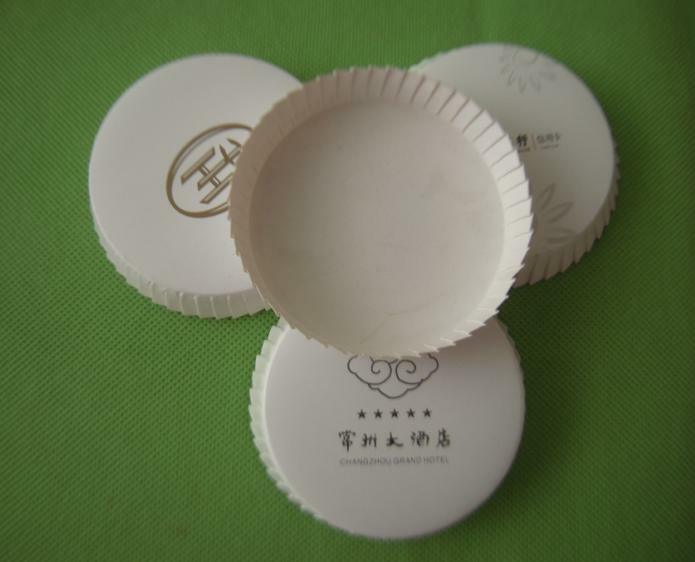 It was a standard paper lid that you normally would find on top of hotel room glassware. Why was it on the mug? It definitely wasn't to keep the beverage hot as the paper isn't insulating. It's generally used to keep glassware clean of ambient dust and floating particles over long periods of time. The Daily Show probably hired a caterer to provide craft services for the president and his entourage of aides and Secret Service guards, and the caterer supplied the covers. Jamesonian: It definitely wasn't to keep the beverage hot as the paper isn't insulating. While the rest of your answer is correct, paper is certainly insulating, and since heat rises, a lid of any sort will keep the contents hot much longer. Plastic isn't normally considered insulating, but the covers on to-go cups certainly keep coffee hot much longer (as well as preventing spills). My guess is someone forgot to remove the paper cover, and since the POTUS didn't drink from it, it remained on. Yeah, that's definitely a paper cover that hasn't been removed yet. My guess is that it's standard procedure that the Secret Service secure any such items that will be served to the President. The cover tells the President that the contents are safe to drink. Normally, the President would remove the cover. He just hasn't done so. I noticed the exact same thing during the president's 9/18/12 appearance on Letterman. Then, the paper cover was present for the first two segments, and was gone by the third segment. My guess is some security thing, that comes off when he drinks from it for the first time. I've seen or heard the same thing. Specifically about Madonna. But if it's a thing, I'm sure there are "consultants" who charge celebrities tons of money for DNA cleanup services. I sort of have a feeling that if the Secret Service does this, it isn't to the extent that a President would display it on TV like that. I'm sure it's just a "this is the president's drink" kind of thing, with a side order of making it harder to slip/drop/throw something in it from afar. I think it would be unseemly not to have some kind of cover for a mug that's sitting around for a while and is intended for the president. It could collect dust, insects, or other disgusting particles if it were exposed. That's always a risk with an exposed beverage. To avert possible dribbles down his tie? What Thorzdad said is correct. I learned this from a White House tour several years ago; another person on the tour asked about a similar occurrence regarding Bill Clinton, I think. It's a Secret Service safety measure. It is definitely not optimal. But, my guess is that that lid is there for all the guests and it is usually lifted right before they come on and it was either forgotten or told to leave it. Scratch, I don't think the POTUS requires a sippy cup. > My guess is that it's standard procedure that the Secret Service secure any such items that will be served to the President. Not just secure them but possibly make them. A friend once offered to make the president a cup of tea at her house, and one of his security people (politely) stepped in to make it instead. this is absolutely a presidential/secret service thing, and was not just a detail missed by the staff. what you can't see in the screencap is that the cover probably has the presidential seal. I work on the Daily Show and am involved with the placement of the mugs every day. When the Secret Service spoke with me about what we usually do for the show, I asked about the mugs knowing it would be an issue. "Let me introduce you to the Navy Mess," the lead agent said. So, I met the appropriate person from the Navy Mess. I gave her a brand new mug which she disappeared with. She kept possession of it the whole time and filled it with water herself. She explained to me that the when he sees the paper lid (which is embossed with the seal of the President), he knows that it has come from the Navy Mess and is safe. She offered to remove it before the segment started, but we cleared it with the control room that if it made the President feel safe to have it there, they could live with it. I was on Reverend Jackson's security detail for the convention and you'd be utterly amazed at how thorough those guys are when it comes to this stuff. During the 1996 DNC in Chicago, we worked with the secret service to supervise the the blowing up of every single balloon that was dropped on the last evening. Even though high-schoolers were doing it in a large gym at Malcolm X college, they weren't leaving anything to chance. Now, I am afraid for copycat paper cup lids with the presidential seal on them. Another illustration of Secret Service attention to detail, which goes back to Ted Kennedy's 1980 presidential run, during which he had Secret Service protection: I was working at a Massachusetts newspaper, where Ted would drop in once or twice a year for a chat with the newsroom and editorial folks. On the day of his visit that year, one of our business office clerks rode a freight elevator to the top floor of the building to a records storage area to retrieve a needed file. While she was in the room looking for it, a Secret Service agent walked in to ask what she was doing there. This room was two floors above the area Ted was visiting. Then, he pointed to a couple of boxes that had been placed in the room a few days before. "What's in those boxes?" he wanted to know, "They weren't there last week." I suspect this kind of thoroughness is one legacy of Nov. 22, 1963. I was there! When someone dashed in during the commercial break and removed the cover, the president drank immediately - I had assumed it was a security measure and that they had forgotten to remove it before the top of the show, since it was off for the second segment.